[S4569] Copy of the marriage certificate of George Pask and Mary Louisa Hampson, 17 April 1890. Obtained from www.ancestry.co.uk. [S3] GRO Indexes to Marriages. "1890/Q2 PASK, George = HAMPSON, Mary Louisa Wandsworth 1d 1111." [S1782] Image of the 1891 Census for Belvoir Stables, Belvoir, Leicestershire: RG12 Piece 2583 Folio 100 Page 22. [S4563] E-mail from David Myers to Stuart & Teresa Pask dated 10 March 2013. [S1783] Image of the 1901 Census for Belvoir Stables, Belvoir, Leicestershire: RG13 Piece 3053 Folio 80 Page 11. Research Note: Searched extensively for Harriett in marriages, deaths, and census, but not found. Record set Monmouthshire Marriages And Banns. [S3] GRO Indexes to Marriages. "1839/Q2 PASK, James = PRICE, Harriett Pontypool 26 195." [S5545] Image of the 1851 Census : Piece 2443 Folio 165 Page 12. Baptised 7 October 1838 Jane illegitimate daughter of James & Harriet Pask of Mynydd-Bach, a Labourer. [S1788] Image of the 1841 Census for Wolves Newton, Monmouthshire: HO107 Piece 0747 Book 16 Folio 3-4. [S4] GRO Indexes to Deaths. "GRO Online Index: 1851/Q2 PASKE, James Chepstow 26 52, aged 80." [S343] E-mail from Paula Payne to Stuart & Teresa Pask dated 22 June 2007: Wolvesnewton Baptisms 1813-1931 "Thomas, Charlott & Hannah bas chi/l pf James & Harriet Pask otp Labourer." Wit:- Geo Horton; Margt Horton, X Banns. [S3] GRO Indexes to Marriages. "1861/Q2 PASK, Hannah Chepstow 11a 11." [S343] E-mail from Paula Payne to Stuart & Teresa Pask dated 16 June 2010. Research Note: Searched extensively for Jane in marriages, deaths, and census, but not found. [S2] GRO Indexes to Births. "GRO Online Index: 1838/Q2 PASK, Jane -- Chepstow 26 64 (No mother's name given)." [S343] E-mail from Paula Payne to Stuart & Teresa Pask dated 22 June 2007: Wolvesnewton Baptisms 1813-1931. [S1791] Transcript of the marriage of Joseph Pask and Emma Hale, 27 March 1857. Kindly provided by Sandra Stevens - GOONS Marriage Challenge. [S1794] Image of the 1881 Census for Mill House, Great Whelnetham, Suffolk: RG11 Piece 1836 Folio 73 Page 14. [S174] E-mail from Jo Pask to Stuart & Teresa Pask dated 31 July 2008: Transcript of Monumental Inscriptions at Great Whelnetham Parish Church, visited on Monday 28 July 2008 with Dorothy Pask. [S1792] Image of the 1861 Census for Lawshall, Suffolk: RG9 Piece 1132 Folio 144 Page 14. Indexed incorrectly under the name of PARK. [S1793] Image of the 1871 Census for Great Whelnetham, Suffolk: RG10 Piece 1724 Folio 79 Page 14. [S1795] Image of the 1891 Census for Mill House, Stummingfield Road, Great Whelnetham, Suffolk: RG12 Piece 1447 Folio 63 Page 12. [S4] GRO Indexes to Deaths. "1900/Q1 PASK, Joseph Thingoe 4a 584 age 66." [S4999] Website UK Government Probate Search Service: PASK Joseph of Great Whelnetham Suffolk miller and farmer died 8 March 1900 Probate Bury St. Edmund's 14 April to Emma Pask widow Effects £1109 10s 9d. But all is well that's dony by Thee. [S1796] Image of the 1901 Census for Mill House, Great Whelnetham, Suffolk: RG13 Piece 1751 Folio 71 Page 11. [S4] GRO Indexes to Deaths. "1914/Q1 PASK, Emma Bury St E 4a 1059 age 80." [S4999] Website UK Government Probate Search Service: 1914: PASK Emma of Great Whelnetham Suffolk widow died 4 January 1914 Probate Bury St. Edmunds 5 February to Thomas Harris Andrews farmer and Angelina Borley spinster. Effects. £822. Resworn £872. [S1797] E-mail from Richard Evans to Stuart & Teresa Pask dated 6 August 2005. [S3] GRO Indexes to Marriages. "1870/Q4 PASK, Eliza Lambeth 1d 454." [S2874] Transcript of the marriage of Richard Wessell and Eliza Pask, 29 December 1870. Kindly provided by Marion Harper Hopkins - GOONS Marriage Challenge. [S3050] E-mail from Marion Hopkins to Stuart & Teresa Pask dated 18 March 2008 (Lambeth Marriage Challenge). [S2628] Image of the 1881 Census for 11 Peabody Buildings, St. Saviour, Southwark: RG11 Piece 0520 Folio 109 Page 40. [S2626] Image of the 1891 Census for Rotherhithe London: RG12 Piece 0385 Folio 34 Page 8. Indexed incorrectly under the name of WARNELL. [S2625] Image of the 1901 Census for 149 Rotherhithe New Road, Rotherhithe, London: RG13 Piece 0400 Folio 70 Page 8. [S1798] Transcript of the marriage of Reuben Flack and Mary Ann Paske, 30 July 1860. Kindly provided by Sandra Stevens - GOONS Marriage Challenge. [S3] GRO Indexes to Marriages. "1860/Q3 PASKE, Mary Ann = FLACK, Reuben Thingoe 4a 617." [S2220] Image of the 1881 Census for The Drift Cottage, Rede, Suffolk: RG11 Piece 1837 Folio 41 Page 224. 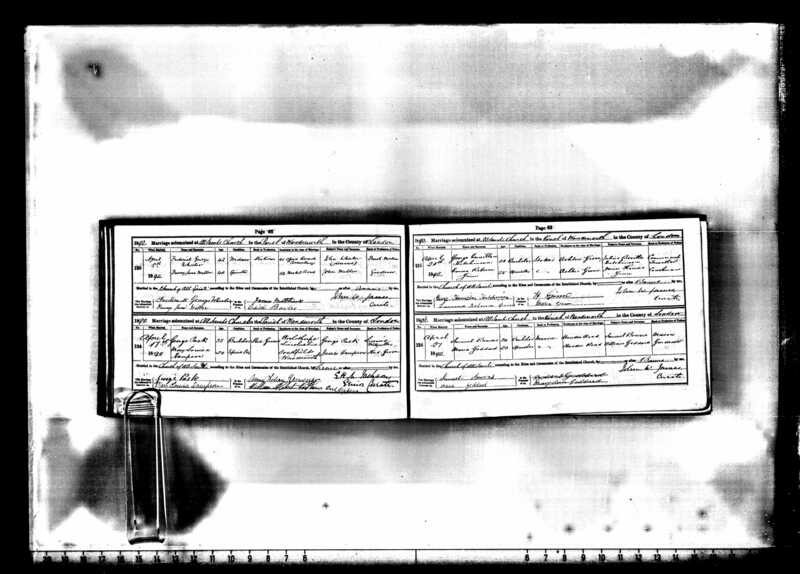 [S1802] Image of the 1891 Census for 43 Livingtone Road, Christchurch, Monmouthshire: RG12 Piece 4368 Folio 73 Page 11. [S1803] E-mail from Pam Hall to Stuart & Teresa Pask dated 10 December 2005. [S417] Website Ancestry Civil Registration - Marriages: "1873/Q2 STOCKWELL, Alfred Newport M. 11a 294 = PARK, Elizabeth." [S3] GRO Indexes to Marriages. "1873/Q2 PARK, Elizabeth Newport M. 11a 294." [S1805] Image of the 1881 Census for 2 Livingstone Place, Christchurch, Newport, Monmouthshire: RG11 Piece 5259 Folio 12 Page 17. [S1804] Image of the 1901 Census for 41 Glebe Street, St. John Maindee, Newport, Monmouthshire: RG13 Piece 4962 Folio 37 Page 20. [S2705] E-mail from Susan Ball to Stuart & Teresa Pask dated 19 August 2007. [S2] GRO Indexes to Births. "1850/Q4 STOCKWELL, Albert Frederick Newport M 26 122." [S2] GRO Indexes to Births. "1879/Q1 STOCKWELL, Gwenllian Newport M. 11a 219." [S2] GRO Indexes to Births. "1883/Q1 STOCKWELL, Jessie Newport M. 11a 172." [S2] GRO Indexes to Births. "1886/Q1 STOCKWELL, Margaret Newport M. 11a 182." [S2] GRO Indexes to Births. "1888/Q1 STOCKWELL, William Newport M. 11a 165." [S2] GRO Indexes to Births. "1875/Q4 STOCKWELL, Alfred Newport M. 11a 181." [S1877] Image of the 1891 Census for Parson Grove, Cambridgeshire: RG12 Piece 1303 Folio 98 Page 1-2. [S2] GRO Indexes to Births. "1881/Q3 WILKINSON, Emily Holbeach 7a 398." Mary passed away peacefully, surrounded by family, at Royal Jubilee Hospital. 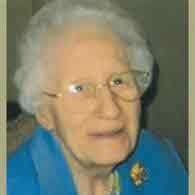 Predeceased by her husband of 63 years, Leonard (Len); she is survived by her daughters, Beth Healey and Sheila Maxwell and her sons, Len Thomas (Judy) and Art Thomas (Marilyn); 11 grandchildren; 12 great-grandchildren and many close, caring relatives and friends. Mary was born in Zeneta, Saskatchewan on the family farm and taught school in Saskatchewan for 3 years before moving to Victoria in 1943. [S1807] E-mail from Sheila Maxwell to Stuart & Teresa Pask dated 2 March 2006. [S871] Information supplied verbally by Dorothy Pask.